Take everything out of the inside of your turkey (little bag with liver, neck bones etc) Salt & Pepper inside the large cavity which you will stuff later. Boil water in a tea kettle and pour boiling hot water all over your turkey. 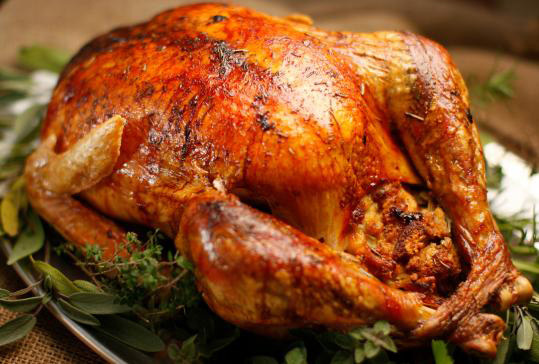 This will make the skin contract and tighten over the meat of the bird and seal all the juices inside during cooking – hence your turkey will be mouth wateringly juicy! Melt 2-3 blocks of your butter in a pan and put in a mixing bowl. Slowly mix in 1/2 bottle of dry white wine into bowl with melted butter (sauvignon blanc or pinot grigio is good for this) Take cheesecloth and fold until it is four layers in thickness. Place cheesecloth in butter/wine mixture and allow it to soak up all it can. Salt, Pepper, Shmear some room temperature butter all on outside on skin & stuff your turkey now. Turn your stove onto a heat BETWEEN medium & high and put oval roaster onto burner Preheat the Oval Roaster and do the water test to see if it’s ready to sear the bird. This is the test where you put a little water in your hands, throw it inside the roaster and if the water beads up and dances, the pan is now hot enough to sear in. Sear the turkey breast & leg side down first, then turn it so its back is down and let that side sear as well for 1-2 minutes. Tie the little feet together. Drape cheesecloth over the breast and drumsticks of the bird. Close the Oval Roaster lid and have burner turned to heat level somewhere BETWEEN medium and high. Once you see spitting coming out of all sides of Oval Roaster, you are ready to turn down the heat. Make sure there’s quite a bit of spitting because this means your pan is hot enough to go into vacuum once the heat gets turned down. Before you turn it down though, open the lid and with your baster, soak the cheesecloth again with the wine & butter mixture. Put your lid back on and turn the heat to BETWEEN medium and low. (it is very important not to turn heat all the way low because the bird will not continue to cook – it will only be kept warmed and you want it to continue cooking) Make sure that on that setting that’s BETWEEN medium & low, you can still hear a good simmer going on inside of the pan – this means the bird is still simmering/cooking. You can open it once or twice more at this heat and re-soak your cheesecloth with your baster using the butter/wine liquid mix. Just make sure that you do this very quickly so you don’t lose much hit, and that when you close your lid the simmer is still going at a good pace. (if after you re-soak your cloth your simmer is not going, you may have to turn the heat up for a few minutes and get your spitting action again before you can turn it back down to keep the simmer going). Also, once it’s done you can turn your oven to broil and put the whole roaster in the oven (without the lid ofcourse) and brown the top of the bird! 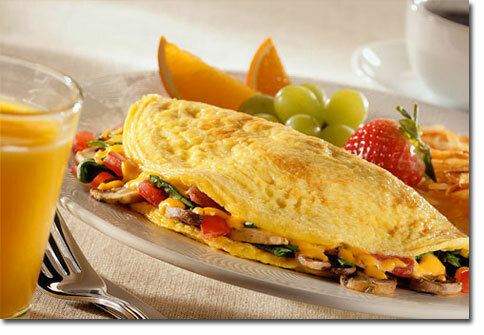 For 3-4 egg Omelet use large (11″) Gourmet. Here’s the 100% foolproof no stick method that you will love! Pre heat covered gourmet skillet (with butter or well sprayed with Pam or any other Cooking spray) on MED. LOW (half way between med. and off) for 5-6 min or until indicator has reached 40 C or GREEN ZONE ON HEAT INDICATOR. Beat eggs together along with 1/3 tsp. of water per egg. Once proper temperature (40) has been reached, pour into skillet, cover and time for 2 1/2 min. The omelet will not stick and slides right out and they are very light and fluffy. I put my cheese, ham, onion or whatever you choose on 1/2 side after the 2.5 min. I fold it over in the skillet and slide it off onto the plate. Fried eggs come out beautifully if you cook them the same way for 2 1/2 min. (med yolk). Preheat dry covered skillet on slightly more than medium heat. Do water test to make sure skillet is hot enough (water dances). Place steaks (which have been peppered only, on both sides) firmly into skillet and cover. Time for 3 minutes, lift lid and turn steaks with fork (again pressing firmly). Quickly spread mushrooms over and around steaks and cover. Time for 4 more minutes, then remove skillet from heat and place on cold burner. Let “set” for 3 minutes for medium rare or 4 minutes for medium well. Lift lid and remove steaks to serving plate. Cover with utility bowl and set skillet with mushrooms in it back on medium-high heat. Add remaining ingredients (except wondra) and blend together. When liquids begin to bubble, sprinkle wondra into sauce to smooth and immerse the flavors and textures together. (1 1/2 minutes max.) 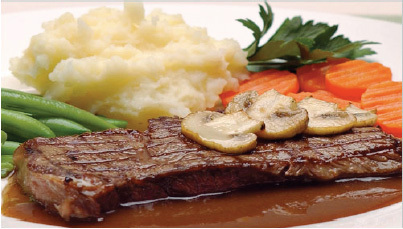 Place steaks onto individual dinner plate, liberally ladle sauce on top of each steak. Suggested accompaniments: Mashed potatoes, fresh carrots and green beans. A delicacy such as this certainly deserves a Messerstahl steak knife!